I brought Daisy Mae, #632, home as a foster on Christmas Eve Day of 2005, at the age of almost 6. She walked in and greeted everybody like they were long-lost relatives, and I knew that I wanted to keep her. 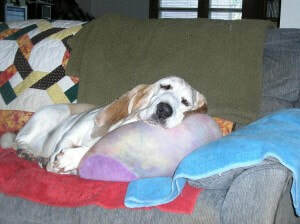 Daisy was quite the character, but also the sweetest basset. Sleeping upside down was one of her favorite pastimes, as was sleeping on top of the couch without ever falling off once. While her health lasted a good many years, the past six months brought a change of gradually going downhill. We released her from her pain, and can only hope she is reunited with her original housemates Sophie, DJ, and Lucy the Westie. We will never forget her.